I love spaghetti. When I was a kid I used to spend ages twirling it around my fork even though most of it would fall off en route to my mouth. I ended up with more spaghetti on my face than in my mouth but for me that was all part of the fun. As an adult, my spaghetti eating skills have not improved much. If there was an Olympic event for messy eating, I would surely take out gold. In fact when we went to Venice a few years ago, I actually bought a spaghetti bib – so maybe I’m not the only one with spaghetti issues. Talking of spaghetti issues, bolognese has always been a staple in our house so can you imagine my surprise when suddenly David announced that he no longer cared for my much loved Spag Bol. It turns out that he still loved the bolognese, and he still loved the pasta but he had definitely fallen out of love with spaghetti. “Why?” I hear you ask. 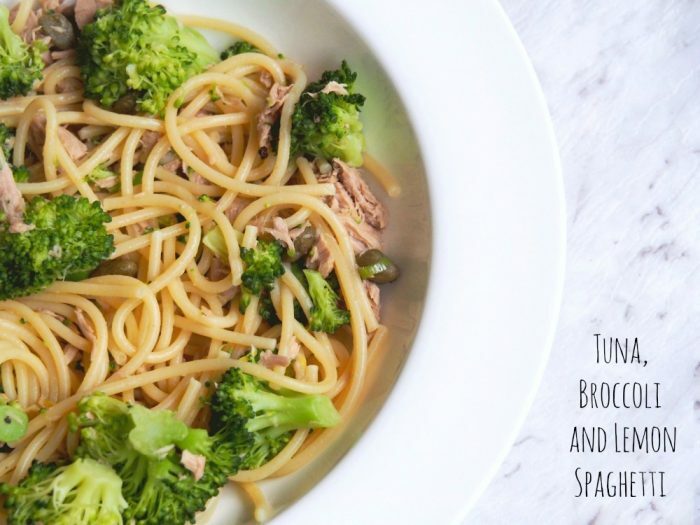 Because, “insert drum roll,” spaghetti is too difficult to eat! I know I’m always right but on this occasion, David’s not wrong! However, even David will make an exception for this delicious dish! 15 minutes is all you need to whip up this fresh, light and healthy fish pasta with olives, capers and greens. It’s fast, fresh and filling and perfect for a midweek meal. So tell me, are you a member of the Messy Eaters Club? Do you think spaghetti is too difficult to eat? Add the broccoli and boil for 4 minutess more or until both are just tender. Meanwhile, mix the spring onions, capers, tuna and lemon zest and juice in a large serving bowl. 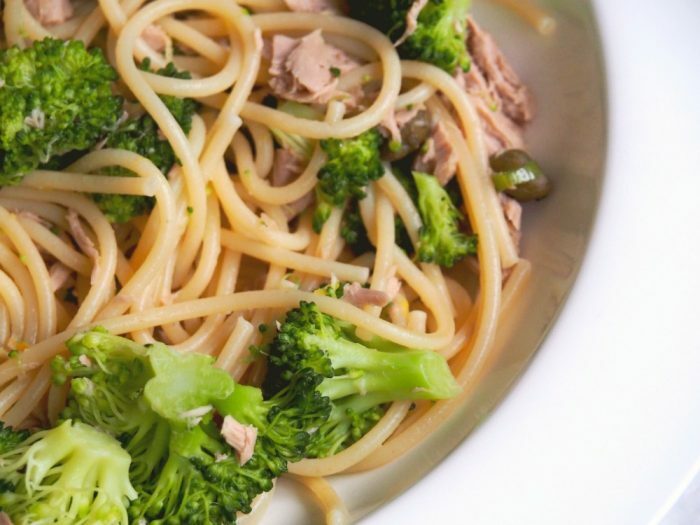 Drain the pasta and broccoli, add to the bowl and toss really well with the olive oil and lots of black pepper. Serve with a little extra olive oil drizzled over. TIP: If you’re watching your waistline, you can omit the oil. It will still be fabulous but just not as fattening!